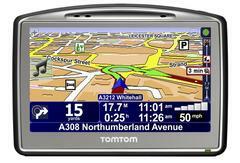 Having cornered the market in car navigation, TomTom have made their new GO I-90 device more multi-purpose by moving into in-car entertainment or infotainment as they like to call it. The word ‘infotainment’ makes me think of the dreary educational computer games my parents used to foist upon me, but, TomTom’s infotainment features are altogether more useful. Including a voice-activated radio, it also links up to your mobile to allow you to use your phone hands-free. These features are combined with the classic TomTom features: a pre-installed map of Western Europe; TomTom Map Share technology – so drivers get daily map changes from the TomTom community; TomTom Safety Alerts, including safety cameras; and an Help-Me! emergency menu – local information to get help quickly. It is compatible with most phones and also has a USB connection for MP3-players and iPods. I would love to purchuse the winnie the pooh tv and dvd set but HOW?